Bookmark collectors may wish to take note of this list of bookmark collectors who are interested in trading bookmarks — worldwide! To register, we need your full address, your email address and a personal message from you. Due to security reasons, we’ll publish only the town and country of your residence. Currently they have 183 collectors from 36 different countries on the list. Note that you can also look for collectors to trade with by country too. To see the latest additions to the exchange list, just scroll down past the offer to purchase 50 bookmarks. Image from The Art of Bookmark Exhibition. Gift Idea #1 Newspaper Archives is the largest online newspaper archive, with over 100 million pages, covering more than 400 years, from more than 10 countries — and growing! I know that as a collector and researcher, having an online database of old newspapers to search through is one of the most awesome things ever. Let me repeat that: One of the most awesome things ever. This isn’t just a great gift idea for collectors, history nuts, or those obsessed with research; it’s a great tool for genealogists too. While genealogy sites offer lots of information, old newspapers help fill in more of the stories… Not just information on people and events, but it’s a great way to find photographs of buildings, family businesses, and other places long gone. Gift Idea #2 Magazines, such as Antique Trader, The Magazine Antiques, and other collectible publications as well as genealogy magazines can still be subscribed to online at Amazon — and even though it may take 6 to 10 weeks for the first issue to arrive, you can have a gift notice sent to the recipient! 3.) Enter your gift recipient’s address during the checkout process. 4.) After placing your order, look for the “Send Magazine Gift Notification” link on the order confirmation page, or go directly to the Magazine Subscription Manager to manage your gift subscriptions. Gift Idea #3 Maybe you’ve already settled on a gift card, but aren’t sure how to present it? 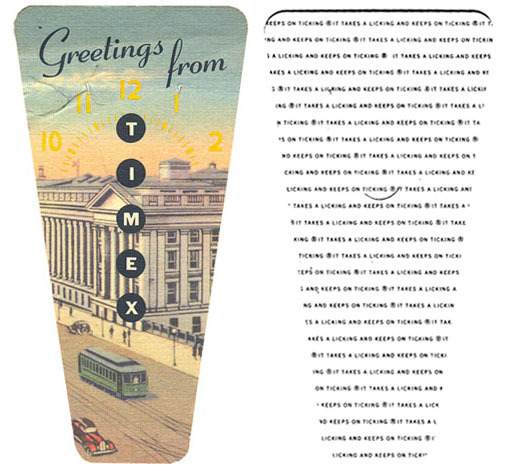 How about a nifty greeting card that’s also a bookmark? In My Book® is a line of 15 cards which are perforated, so tearing along the perforations changes the greeting card into a bookmark! Related: Practical, Yet Thoughtful, Gifts & Stocking Stuffers For Collectors. 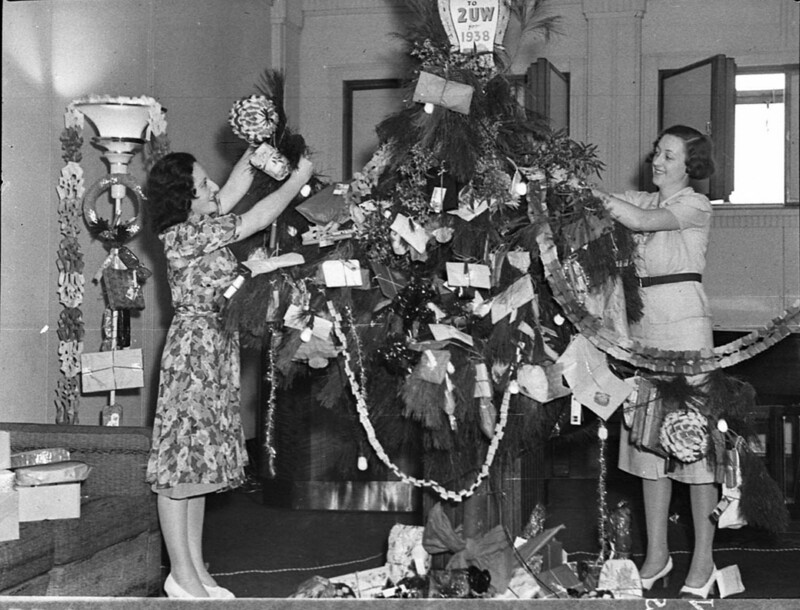 Image credits: Christmas tree in Sydney’s 2UW radio station, Christmas Eve, 1937; via. Lauren Roberts is a bookmark collector I met when we were both presenters at the first Bookmark Collectors Virtual Convention. I’ve admired her bookmark collection — and collecting habits — so much I’ve been waiting for us both to have the time to do a proper interview. Lauren, besides being a collector and a blogger, what’s your daytime, meat & potatoes, gig? I work as an administrator at a community college. It satisfies my urge to eat and live without worry, but my passion is with BiblioBuffet, books, cats, reading, and bookmarks. When did you begin collecting bookmarks and why? I fell into it purely by accident, which you can read about here, in my first On Marking Books column. About 45 minutes inland and south of Santa Barbara is a quaint town named Ojai (prounced “oh hi”). It is famous for the Ojai Resort, which is quite pricey and attracts a lot of out-of-towners, but it is even more famous as the home of Bart’s Books, which has been there since the mid-1960s. The store has been modernized now–it even has a blog–but at the time of this discovery, around ten years ago, I’d guess, it was still owned by the old owner and there was no Internet page or even pricing. The store is actually an old home, and both its “yard” and the house are full of the kind of rickety old shelves you’d expect to find. Outdoors is where the cheaper books are even though they are still protected from the weather. You can sit on benches under trees and just read. They also have books they leave outside the gates so if you feel the need to browse at 2:00 am you can; just toss your money in a box. I was in the former living room when I saw the old olive-colored book on books (which I adore). I sat down in the chair with the book to look it over. 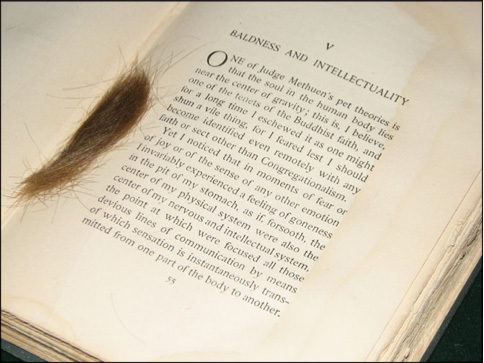 When I pulled the cover, it automatically fell open to the chapter titled “Baldness and Intellectuality.” Marking the beginning of that chapter was a bookmark made of hair, golden brown, male by the length of it. I was utterly charmed and remain so. You can see the book and bookmark in my antique coffee table. Being a reader and book lover, the transition to bookmark collector seems rather natural. But readers are usually selective; they won’t just read anything. Is it the same with your bookmark collecting? Do your bookmarks reflect what you read in terms of subject matter? What do you focus on in terms of collecting bookmarks in terms of themes? It’s true that I am fussy about my library. I love nonfiction and literature that is older than I am, especially classical literature. (I’m not at all interested in modern fiction.) 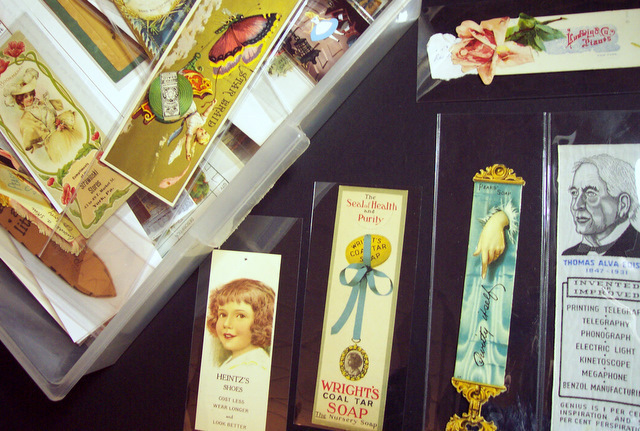 When I began to collect bookmarks I went after vintage ones. I would browse eBay a couple of times a day looking for pieces that just stood out to me in the same way I browse bookshelves looking for books that appeal. eBay was so great when I started; it has, unfortunately, gone downhill in its attempt to move beyond the collector into retailing. 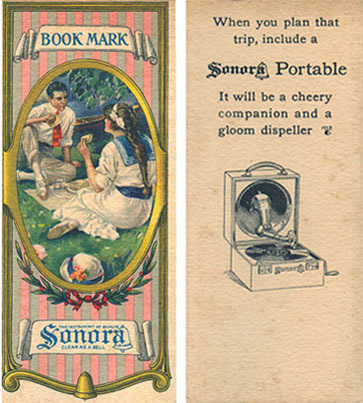 But then sellers would often be selling what they found in attics and such. Bookmarks are much more popular now than five years ago when they were one of the tiniest niche markets around. You really had very little competition. Now, it’s larger though not large by other collections. The unusual ones that I like often go for hundreds now. I can’t afford those. So my buying has tapered off, I am sorry to say. But not my interest. 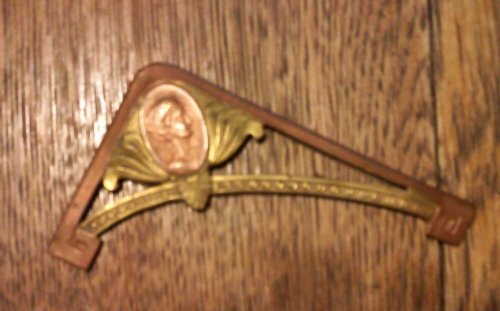 My bookmarks don’t reflect my reading interests since, as I said, I like and collect vintage and antique ones. I can’t think of any subject I won’t collect a bookmark about, though religion is something I tend to avoid. I also avoid most modern ones since they aren’t particularly attractive. I am not out to build a large collection but one that is meaningful to me. Every piece in it is special. What are some of the themes? 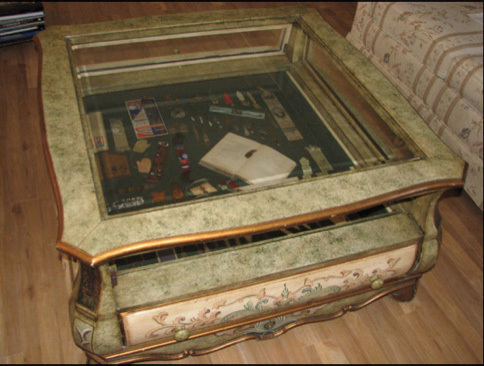 I didn’t set out to collect in any niches, but from the beginning was attracted to vintage and antique ones. I occasionally found and find a modern one I like but really, it’s the older ones that fascinate me more because the quality of the work that went into them. Even companies that used them as advertising for washing machines or watches or hotels or whatever used die-cut designs, thick paper, elegant graphic design, and attempted to make them beautiful pieces that people would keep and use for a long time instead of today’s cheaply made, “just sell it” ones like those that authors give away. I guess you could say my interest lies in bookmarks up to about the 1950s or early 1960s, about the time I was born. Some of themes I have are food, books, home, WWI, WWII, political, book festivals, clothing and accessories, places, travel, library, metal, fabric, worlds’ fairs, exhibitions, ivory, wood, pianos, sewing, music, garden, beauty, shoes, education, smoking, and many more. 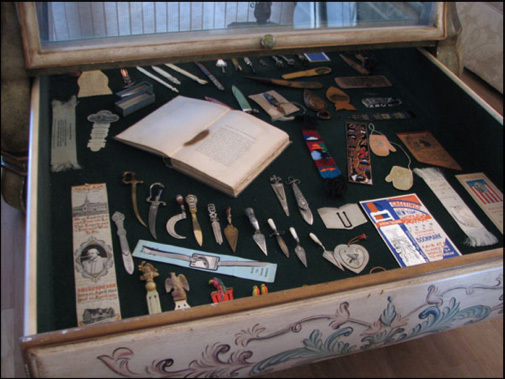 Even though bookmarks take up less space than most other collectibles, a person (unfortunately) has to limit, pick and choose, what will become part of their collection. What collecting standards do you have? I have to love it! That may not seem like a standard but it is. I do not buy it unless I fall in love with it — and, fortunately, I am by nature a minimalist rather than a hoarder. I don’t collect books just to have books. I have done weeding to get rid of books that I had little interest in and by the time I came to bookmarks I had no trouble passing up ones that did not interest me. Plus, now that I have probably around 1,300 of them I can bypass those when I see them, which is rare anyway. When I began collecting I stored them in an open box. When the bookmarks topped the box and threatened to topple over, I got a bigger box. Then another bigger box. After that, I realized I needed to store them. I looked around online a lot, but eventually settled on these archival boxes with three rings inside for archival page inserts. The bookmarks were sorted into large categories (food), then if necessary into sub-categories (candy, cereals, meats, milk, soft drinks, alcohol, etc.). I tried to put more or less relevant categories together in one binder–like home and food–but found I had too many in those two categories to fit into one binder. At the moment I have seven binders and the coffee table. The latter is where I have all the three-dimensional ones, regardless of their theme, plus some of the more unusual two-dimensional ones. What things have you learned from collecting bookmarks? How much history and story can be in one of those little things! That’s the most amazing part of bookmarks to me. When I began collecting and later writing about them I really had no idea how much they could hold. You could build an entire year’s worth of education just on bookmarks. Seriously. When I sit down to research a bookmark for an upcoming column I use both the library and the Internet. And I don’t look at just one site. Wikipedia is often where I start since it gives an overview–not always accurate–plus, more importantly, sources and links. I am also fortunate to be an excellent researcher, Googling various words and phrases to find numerous links. I will go far beyond the first page of results–once I even went to page 93!–to find information. Alas, there have been a few times when I have had to abandon a particular bookmark because I couldn’t get enough information to write about it. But several times now, I think, I have been contacted by people who saw my columns and wrote. One was a family member who corrected a bit of misinformation about the Buster Brown shoe line. Another was searching for old family records. 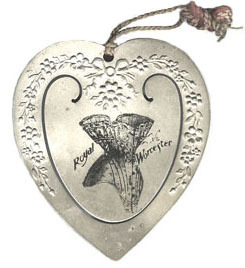 The latest was a descendant of a family that did steel engraving; she was enthralled to find the two bookmarks I wrote about–gorgeous pieces–and said that if I ever wanted to sell them she definitely wanted to buy them. But they are not for sale. I think sometimes about offering talks at schools or groups about bookmarks. And I am only sort of sorry that museums and important libraries do not yet recognize their importance; their willful ignorance helps me stay in the market. I don’t collect bookmarks — so why am I presenting at The First Bookmark Collectors Virtual Convention? Because founder-slash-host Alan Irwin asked me to, even though he knows I don’t collect bookmarks; I guess he just knows I appreciate “everything,” and therefore am quite capable of collecting anything. Truth is, I once had an unintentional bookmark collection. As a young adult with a voracious reading habit and some money in my pocket, I searched for the perfect bookmark — the perfect bookmark being the perfect blend of form and function. And this perfect bookmark had to hold my place in the book too, including when stuffed into the basket on my bicycle and transported over hill and dale to a reading spot under a tree — and then back home again. All that’s an awful lot to ask of a bookmark; but I was confident. So many bookmarks, those years of reading were seriously affected by the preoccupation of all those bookmark trials. I didn’t save many of the bookmarks I purchased in pursuit of The Perfect Bookmark; what didn’t succumb to natural losses, was given away in the disdain of failure. As recently as a year ago, I found a few of the plastic paper clip types in the junk drawer and divvied them up between the kids. But I did save this antique bookmark because its aged beauty outshines its dull performance. 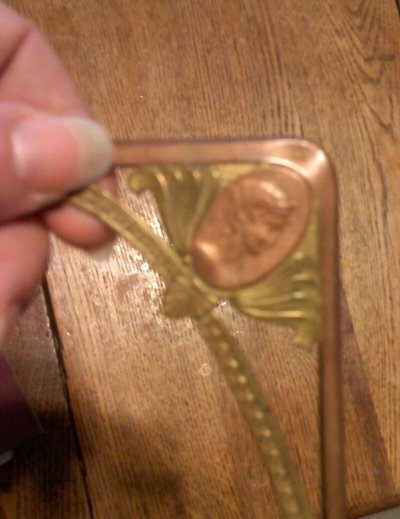 I’m guessing this copper corner bookmark with a regal “cameo” of a woman is from the early 1900’s. The rounded corner limits functionality on square-tipped page corners, among other things, but she sure is pretty! I now wish I had saved all those bookmarks. (Even those purchased new would be retro by now!) Not because of the convention (though I admit, that would be cool as far as talking with other collectors — by the way, did you register yet? ), but because all those rejected bookmarks would have been a museum, documentation of my attempts to discover The Perfect Bookmark. I suspect that, now that I’m no longer so obsessed with finding Thee bookmark, I would not only enjoy those bookmarks for their beauty, but be quite entertained by the stories of them — how I got them, how they fared in their trials… I bet I’d even remember what book each bookmark had been placed in service of; I’m rather visual like that, seeing something and remembering everything associated with it. As it is now, I am amused recalling the purpose-driven antics of my perfection-seeking former self. But the collector in me thinks it sure would be nice to have the tangible evidence of such an obsession. 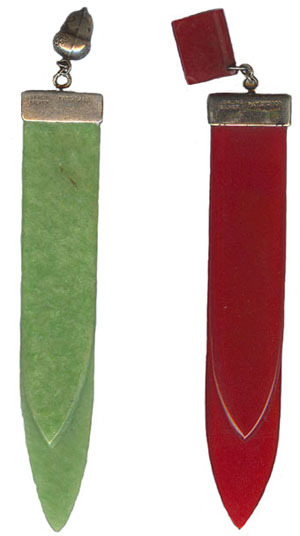 Vintage red and green bookmarks, via Lauren Roberts and her article Bakelite In Books. 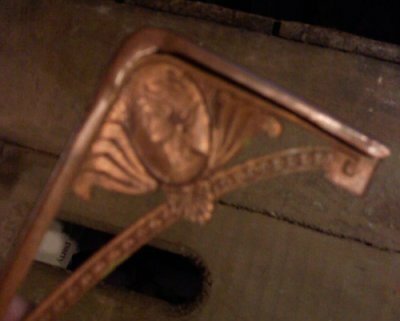 All photos of the antique copper embossed corner bookmark are copyright Deanna Dahlsad. February 20th and 21st there’s an online event which is rather like a Valentine’s Day celebration for collectors: The first annual Bookmark Collectors Virtual Convention. This two-day event you can attend in your jammies sitting at your computer is obviously focused on the collecting of bookmarks, but the rest of us can learn something too. As an ephemera collector struggling to organize my collection, I’m extremely eager to from Don Baldwin on Organizing a Bookmark Collection. And, because old paper bits are one of my things, I’m looking forward to Lauren Roberts (founder of BiblioBuffet — which has a regular column on bookmarks) speaking about How To Store And Display Your Bookmark Collection. Maybe you’ve never articulated why you collect, what your collection “does” — or maybe you have & you just don’t think it’s important in The Big Picture sort of a way. Maybe others have made you feel like a capitalistic consumer pig in your collecting pursuits. Whatever the reason, do you down-play your “junk,” your hobby, and your passion? It is my hope that in this session you will become a more confident collector, to learn to see your items beyond their materialistic cash value and appraise them for their cultural and intrinsic values, to see the very act of collecting itself and your contribution as a collector as significant. Because all collections, great and small — all collectors, great and small — are of incredible value. It’s my belief that all collections and all collectors have value, even if the stuff isn’t “old enough” or “good enough” to seem of any value. I’d tell you more about this, but, frankly, you should come to the conference. Registration is just$10 for all the sessions, forums, and trade show & gallery goodies. So, to entice you — be you a collector of bookmarks or not — with the help of the founder of Doodle Week, Inherited Values very own Laura Brown, I’m offering five Bookmark Collectors Virtual Conference Commemorative Collector Bookmarks for the first five folks (from the US or Canada) who mention “Inherited Values” in their registration for the event. Only 12 of these commemorative bookmarks will be made (five to be given away here, five at the art site that’s home of Doodle Week, one for the artist, and, ever the collector, one for myself), so it’s truly a limited edition. I hope you’ll register for this event because you’re a collecting nut who is interested; but it never hurts to add a little incentive, right? I hope to “see” you there! Photos (2) of bookmarks and bookmark storage both courtesy of bookmark collector Alan Irwin, the founder and host of the Bookmark Collectors Virtual Convention. I’m Going To Need More Books doodle commemorating the bookmark convention by Laura Brown.